On May 11, 2016 Girl Scouts Heart of New Jersey will host a young women's leadership breakfast at Basking Ridge Country Club from 8:00 a.m. - 10:00 a.m. Discussion will be moderated by Tami Erwin, Lauren Ruderman, Katie Meyler, and Naima Ricks. 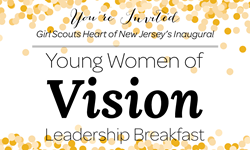 Girl Scouts Heart of New Jersey will be engaging in a critical discussion on women’s leadership at the inaugural Young Women of Vision Leadership Breakfast from 8:00 a.m. – 10:00 a.m. at Basking Ridge Country Club (185 Madisonville Road, Basking Ridge, NJ). The event will explore what leadership means, how Girl Scouts has shaped individual leadership styles, and celebrate the transformative work that is being done in the community through Girl Scout Gold Award Take Action projects. The discussion will be moderated by Tami Erwin, the Senior Vice President & Group President at Verizon. The breakfast will also feature Katie Meyler, a TIME Person of the Year and Founder of More Than Me; Lauren Ruderman, an Emmy-winning NBC Producer and Assistant Director; Naima Ricks, Director of Student Engagement at the College of Saint Elizabeth; as well as recent Gold Awardees Kyla Bates, Laura Lin, Sarah Dedinsky, and Julie McEldoon, who will speak about their projects and what leadership skills they have learned during their time as Girl Scouts. "I decided to create a polymerase chain reaction machine and found the instructions online," said Julie. "I built the machine so more high school kids had access to science and fun!" “Girl Scouts Heart of New Jersey is honored to recognize the hard work and determination of all of these young women leaders. Their journey is an example of our core mission to encourage girls to have confidence and courage to make an impact in their communities and around the world,” said Patricia Carroll, CEO Girl Scouts Heart of New Jersey. Girl Scouts Heart of New Jersey (GSHNJ) builds girls of courage, confidence and character, who make the world a better place by providing girls access to premier leadership programs and mentors throughout New Jersey. GSHNJ provides leadership experiences to over 20,000 New Jersey girls each year. For more information about the Girl Scouts Heart of New Jersey, please visit http://www.gshnj.org. Since 1916, Girl Scouts have been making meaningful, sustainable change in their community and around the world. The Girl Scout Gold Award – the highest honor a Girl Scout can earn – acknowledges the power behind each recipient’s dedication to not only empowering and bettering herself, but also to making the world a better place for others.